The Diné Return to the Four Corners One hundred fifty years later, follow the Navajo people’s poignant route home from New Mexico to Arizona. 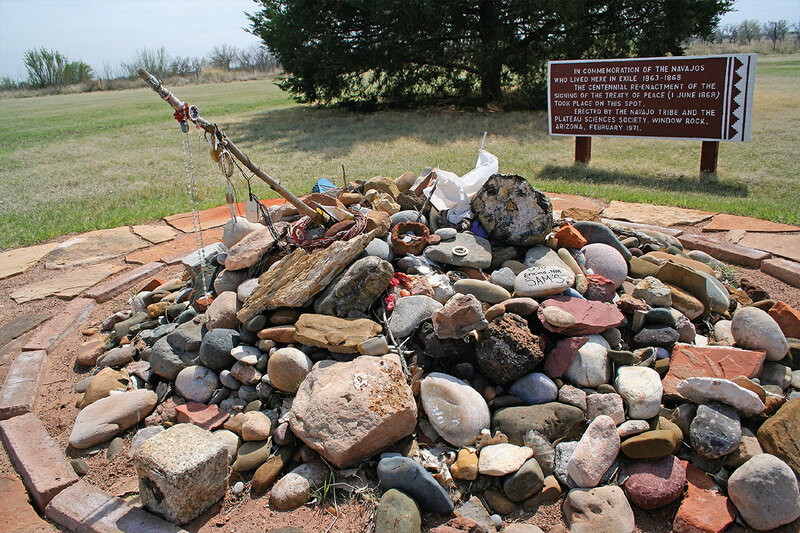 The Bosque Redondo Memorial, a New Mexico State Historic Site adjacent to Fort Sumner, interprets and commemorates the Navajos’ five-year exile at the blighted reservation, and the treaty of 1868 which allowed them to return to their traditional lands in the Four Corners country. 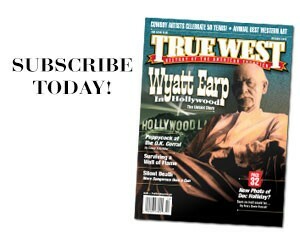 Fort Sumner, New Mexico, has never been an easy place to live. Winters can be brutal. Summers are often blistering. The scenery’s spartan. Few describe the wind as meek. For the Diné—or Navajo people—their confinement at Fort Sumner’s Bosque Redondo Reservation between 1863 and 1868 proved devastating. General James Carleton had dispatched Kit Carson to bring in the Indians, and Carson’s “scorched earth” policy, carried out during the winter of 1863-64, forced the Diné to surrender. Between the summer of 1863 and the winter of 1866, an estimated 11,500 Diné men, women and children were marched 400 miles. Ill-equipped for the journey, only 8,500 reached Bosque Redondo. “The Long Walk,” like the Cherokees’ “Trail of Tears,” remains a blight on our history. 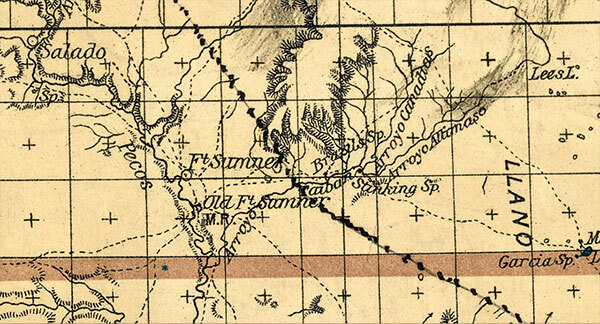 On July 1, 1868, five years after the Navajo people were resettled from the Four Corners to Fort Sumner’s Bosque Redondo Reservation near the Pecos River in New Mexico, Navajo leader Manuelito and U.S. Gen. William Sherman signed the Treaty of Bosque Redondo ending hostilities in perpetuity between the Navajo Nation and the United States. At the reservation, which the Diné shared with roughly 400 Mescalero Apaches, all suffered. Firewood was practically non-existent, and the climate was drastically different than their homeland. Good water was hard to come by, and the Army at Fort Sumner had expected maybe 5,000—not closer to 9,000—prisoners here. 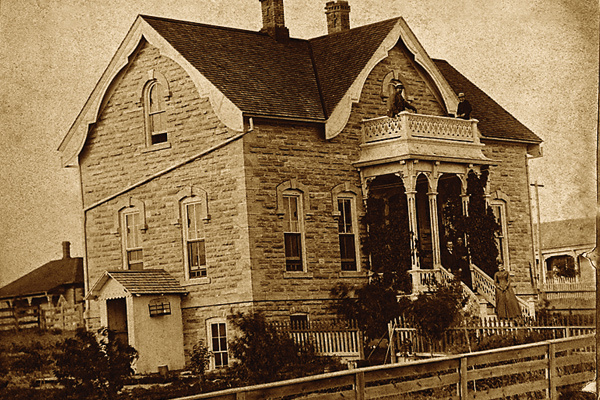 Carleton envisioned a utopia where he would turn the Indians into farmers, but the irrigation system for the fields rarely worked, and “army worms” destroyed what few corn crops managed to grow. The Diné weakened. The Mescaleros got sick of the whole affair and escaped in late 1865. Today, Billy the Kid might remain the main draw to Fort Sumner—with his grave and two museums—but the Bosque Redondo Memorial is the most historical and moving. Yes, that memorial can be demoralizing, but there’s also a story of hope. 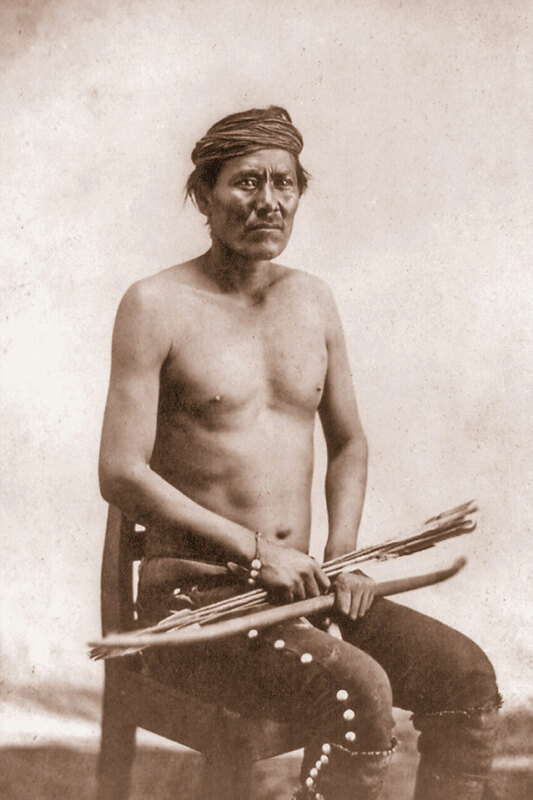 The Diné left Bosque Redondo and returned to a portion of their homeland in 1868. 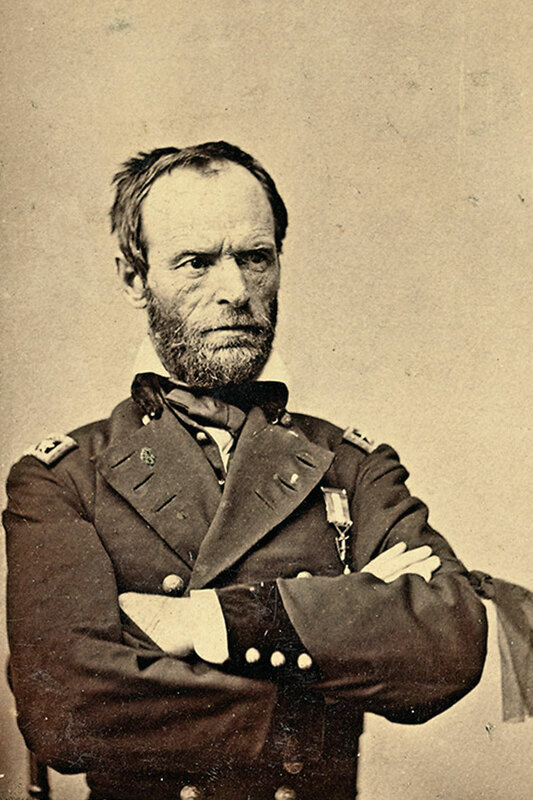 “In pursuance to the Stipulations made by Gen. Willian T. Sherman with the Navajos during his recent visit to the Bosque Redondo, the Navajos will begin to move from the latter reservation to one in their own country, between the 12th and 15th inst. The Senate ratified the treaty on July 25. President Andrew Johnson signed it on August 12. 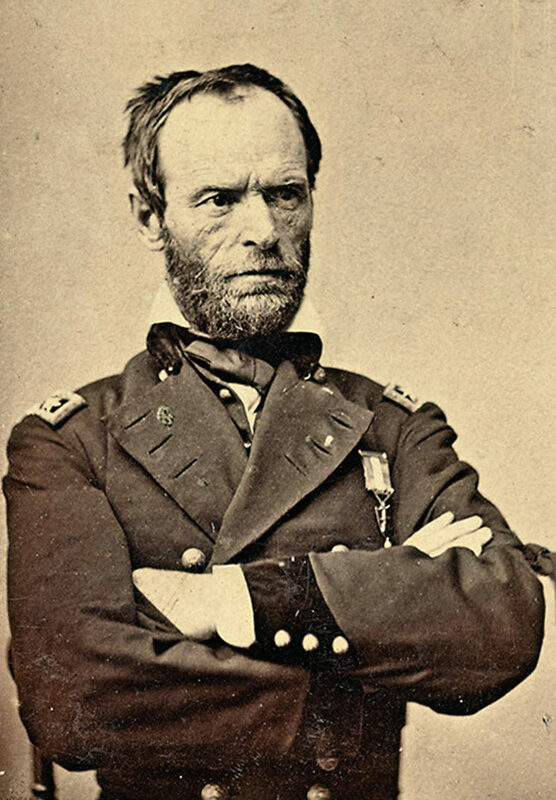 Earlier that year, Gen. William T. Sherman and the Grant Peace Commission had met with the Indians at the reservation. 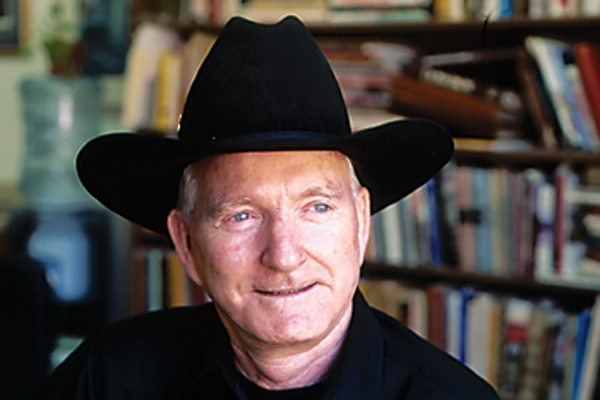 “I found the Bosque a mere spot of grass in the midst of a wild desert, and that the Navajos had sunk into a condition of absolute poverty and despair,” Sherman recalled. 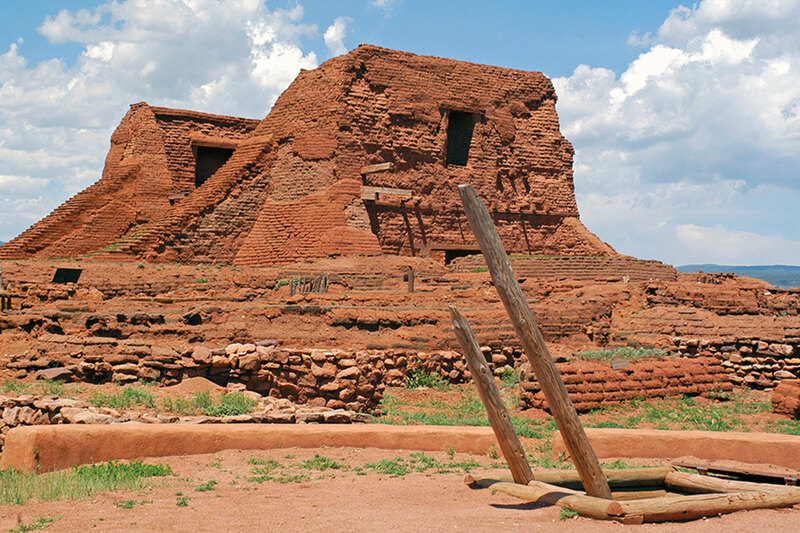 On the Navajos’ walk home from Fort Sumner to the Four Corners, they would have passed the ruins of the Pecos Pueblo Mission Church, which are now protected by the Pecos National Historical Park. On June 1, Diné and white representatives agreed upon the terms. The treaty didn’t give the Indians all of their land back—the four sacred mountains did not fall within the reservation—but, unlike many Indian tribes, the Diné were returning to their own country. The Army escorted the Indians and protected them on a long walk that did not seem quite as long. They began their return home on June 18. 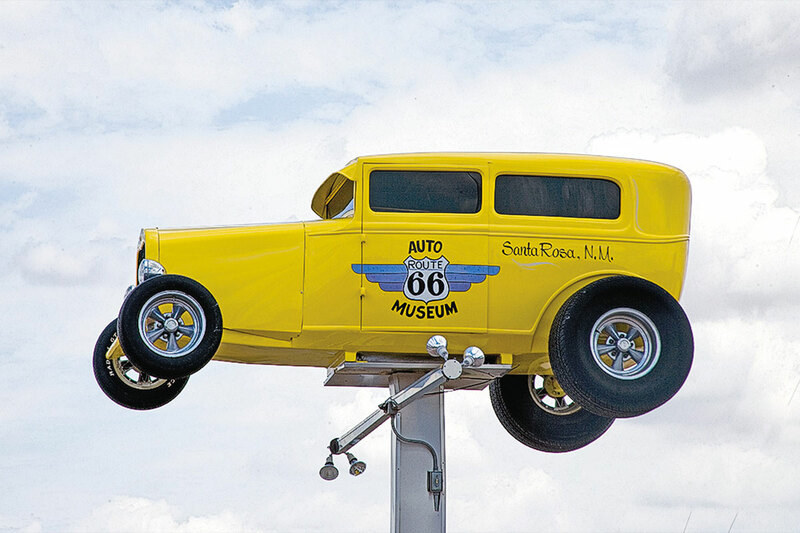 Following the Navajos’ Long Walk home along New Mexico’s Pecos River Valley should include a stop in Santa Rosa, home to the Route 66 Auto Museum. During the Long Walk, the Indians had been marched over different trails—one took them as far north as Fort Union in northern New Mexico. But they took one trail on their joyful journey home. Basically following the Pecos River, they started north to near what’s now Santa Rosa (Route 66 Auto Museum, Mesalands Dinosaur Museum). They didn’t go to Las Vegas—perhaps because they had raided the town in August 1846—but the historic city (City of Las Vegas Museum and Rough Rider Memorial Collection) is a good resting point for today’s travelers. Leaving the Pecos River at Pecos (Pecos National Historical Park), the Indians bypassed Santa Fe for Galisteo and moved south toward Tijeras (Route 66’s “Musical Road,” on which your tires will play “America the Beautiful” as long as you’re driving 45 mph). Window Rock, a natural wonder that is a landmark of the Navajo homeland and namesake of the Indian nation’s capital city, was a welcome sight to the Diné people when they returned in 1869. Then they traveled west, along what today is Interstate 40, through Albuquerque (Albuquerque Museum, Petroglyph National Monument) and Laguna Pueblo (Laguna Burger is a carnivore’s mecca). When the Indians saw Blue Bead Mountain (a.k.a. Mount Taylor) north of Cubero in the San Mateo Mountains, they dropped to their knees and cried. Continuing west, they moved through Grants (El Malpais and El Morro national monuments are worthwhile deviations) and reached Gallup (Richardson Trading Post, founded in 1913). 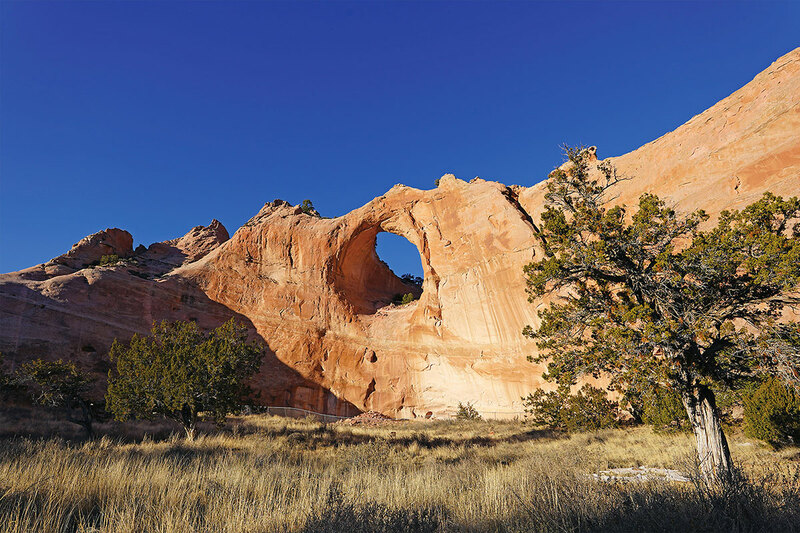 From Gallup, continue the journey to the capital of the Navajo Nation, Window Rock, Arizona, and check out the Navajo Nation Museum for the Diné side of the story. The Diné had sung songs during much of the journey home. They still perform The Enemy Way ceremony for soldiers returning home who have been in combat and/or were wounded or captured. The ceremony brings the honorees into a state of balance—“Hozho”—in the universe. With beauty before me, I walk. With beauty behind me, I walk. With beauty below me, I walk. With beauty above me, I walk. With beauty all around me, I walk. Johnny D. Boggs recommends Diné: A History of the Navajos by Peter Iverson and Four Masterworks of American Indian Literature by editor John Bierhorst. 10 for 10: Dodge City, KS Touring our #8 town of the year, from Boot Hill Museum to Boot Hill Casino. My favorite license plate is Wyoming’s. Can you tell me about its bucking horse logo? 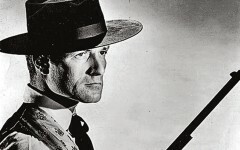 Did The “Buntline Special” Gun Really Exist?